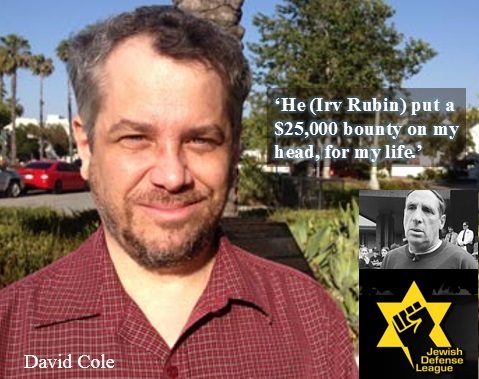 [See JDL attack on David Cole here. [2011 April] FBI Says Eazy-E, Tupac Victims of Jewish Defense League Extortion Attempts New documents released by the Federal Bureau of Investigations (FBI) confirm longtime allegations that the Jewish Defense League (JDL) attempted to extort rappers Eazy-E and Tupac Shakur. J. G. Burg (Joseph Ginsberg) Persecuted and beaten by Holocaust enforcers of Jewish Defense League type thugs. Denied burial in the Munich Jewish cemetery. On January 22, 1992, revisionist activist David Cole was attacked by JDL thugs at a meeting held at the University of California at Los Angeles. Before the meeting began, JDL leader Rubin first tried to push the youthful Cole down a flight of stairs. JDL hoodlums also harassed and pushed around meeting organizer Robert Morrissey. After the meeting commenced, JDL punks tried to shout down the speakers, and then threw food at Cole. Finally, a JDL thug assaulted Cole -- who is Jewish -- hitting him in the face and bloodying his nose. On January 26, 1972, a JDL team firebombed the New York City offices of a US-Soviet cultural exchange agency. Killed in the fire was a 27-year-old secretary (who happened to be Jewish). Thirteen others were injured. One participant, Sheldon Siegel, confessed to police that he had made the bomb, and provided the names of the others involved in the crime. 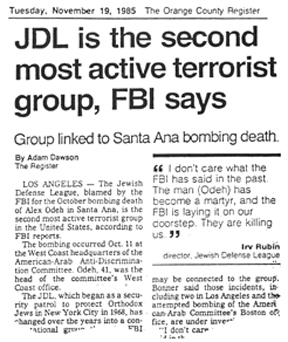 Several years later Kahane acknowledged JDL responsibility for the crime. However, the case against the JDL members who were charged in the incident was eventually dismissed on a technicality. In May 1972, ten JDL thugs broke into the Austrian consulate in Washington, DC, and beat Austria's ambassador to the US, Karl Gruber, as well as the building's janitor. 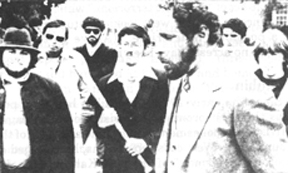 In May 1974, JDL members attacked Arab-American community activist Dr. Mohammed Mehdi with a lead pipe, sending him to the hospital with a broken back. It took nearly a year for the police to make an arrest, even though a perpetrator had appeared on television to boast of the deed. A short time later, Mehdi's offices in Manhattan were almost totally destroyed in an apparent arson attack. On February 21, 1975, a US federal court found Kahane guilty of violating terms of a probation stemming from his 1971 felony conviction for manufacturing firebombs. He had been forbidden from having anything to do with bombs, dynamite or other weapons, or encouraging violence. Citing incriminating letters written by Kahane in which he had urged followers to assassinate Russian and Arab diplomats, the judge sentenced the rabbi to one year imprisonment. Kahane served eight months of this term in a Manhattan halfway house, which he was allowed to leave every day to eat in kosher restaurants. 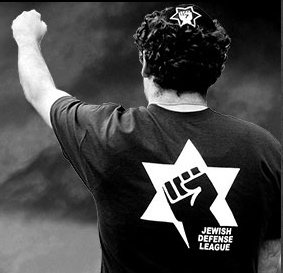 Kahane used this period of "imprisonment" to conduct JDL business. Jewish Defense League responsibility for a terrorist firebombing attack agains an alleged "Nazi war criminal" is reported here in the New York Post, September 7, 1985. In 1975, 21-year-old JDL member David Kamaiko hijacked an executive helicopter in New York City, demanding $2 million ransom to buy guns for the JDL. Kamaiko shot the pilot before he was himself subdued. 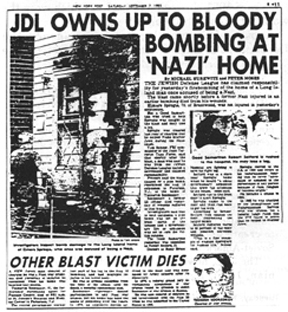 In 1978, Canadian JDL leader Joseph Schachter bombed the home of right-wing activist Donald Andrews. On April 11, 1982, JDL member Allan Goodman opened fire with a machine gun at a Muslim house of worship in Jerusalem, killing two Palestinian Arabs: an elderly man and a 20-year-old youth. After entering the mosque, he continued firing, critically wounding several people. Goodman, from Baltimore, Maryland, had received paramilitary training at the JDL's Camp Jedel in New York state. In an interview, Kahane said of the crime, "There was nothing wrong with what he did...the act was perfectly correct." In 1987, three members of the Jewish Defense League were arrested for their involvement in at least six bombing attacks carried out the New York area between 1984 and 1987. The accused were Jay Cohen, Sharon Katz and Victor Vancier, head of the JDL in the New York area. After admitting his role in the terror bombings, Vancier was sentenced in October 1987 to ten years imprisonment. Another JDL member, Murray Young, was sentenced to five years in prison. FBI officials believe that the JDL was behind the bomb blast in mid-August 1985 that killed Tscherim Soobzokov in Paterson, New Jersey, and a similar (although non-fatal) bombing attack in early September 1985 directed against Elmars Sprogis in Brentwood, New York. Soobzokov and Sprogis were falsely alleged to have been "Nazi war criminals." George Ashley, a high school history teacher and supporter of the IHR, has been the target of several terrorist attacks because of his revisionist views. In April 1982, two bricks were hurled through the front window of his suburban Los Angeles home. One month later, two gasoline fire bombs were thrown against the front of his house, and in December of 1982, JDL criminals ransacked Ashley's home, causing an estimated $26,000 in damage. Mordechai Levy later boasted: "We warned him [Ashley] that if he continued his activity, he would pay a consequence...We warned that if the school board does not stop Ashley, we would stop him." In July 1984, Ashley received repeated telephone calls from someone who threatened to bomb his home. A JDL member identified by police from tape-recordings of the threats was later arrested. 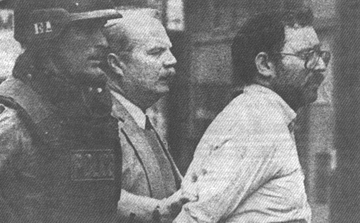 In August 1984, JDL member Michael S. Canale was arrested on suspicion of making a bomb threat against George Ashley. I n September 1984, Zündel's home in Toronto was damaged in a pipe-bomb attack. 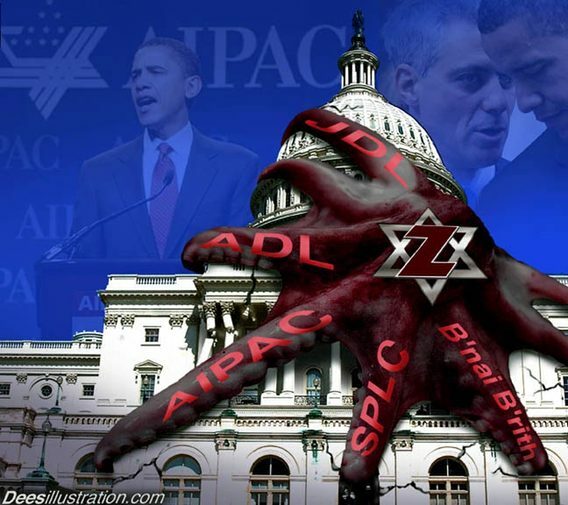 A group calling itself "The People's Liberation Army of the Jewish Defense League" claimed responsibility in a phone call to a local television station. In January 1985, a JDL mob attacked Zündel, his attorney Doug Christie and Christie's female legal secretary at the entrance to a Toronto courthouse. Since its founding in 1978, the Institute for Historical Review has been the leading American publisher of books and other materials questioning the Holocaust extermination story. 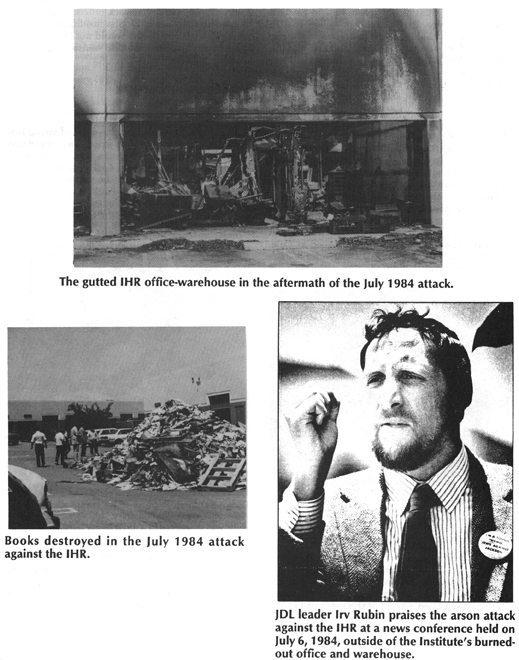 For this reason, its office in southern California, as well as individual IHR employees, soon became targets of a systematic campaign that included a drive-by shooting, three firebombings, vandalization of IHR employee-owned automobiles, slashings of 22 tires of employee automobiles, JDL-organized demonstrations outside the IHR office, and numerous telephone threats during office hours and at night to IHR employees at home. So intense did the harassment become that the family of one IHR employee was forced to move. During the course of a JDL demonstration in front of the IHR office on March 19, 1981, Mordechai Levy and other JDL protesters attacked the car of the landlord's agent, who had arrived to ensure security. While shouting threats, Levy smashed the right front passenger window of the man's car as he drove off. In the early morning hours of June 25, 1981, came the first firebombing attack against the IHR office. Fortunately, the arson device -- similar to a "Molotov cocktail" -- caused only minor damage. A man claiming to represent the "Jewish Defenders" announced responsibility for the attack in phone calls to news agencies. 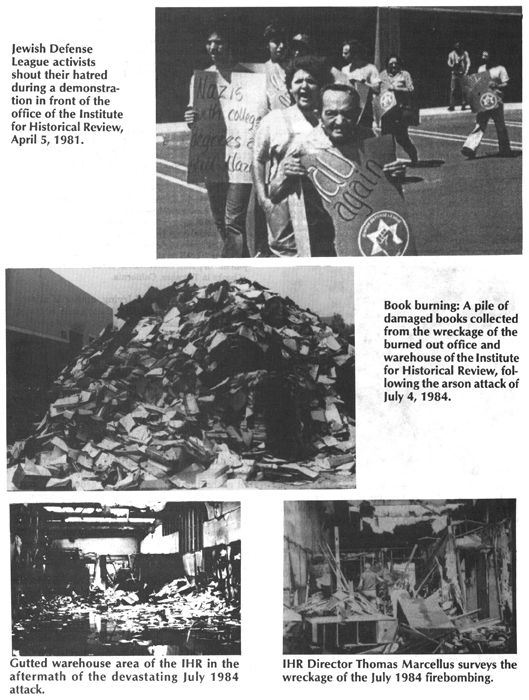 The second arson attack against the IHR office came on April 25, 1982, in which a copy machine, a few pieces of furniture and some records were damaged. In a telephone message to a local news agency, a group calling itself "the Jewish Defenders" claimed responsibility. This terror campaign culminated in a devastating arson attack on the Institute's offices and warehouse in Torrance on July 4, 1984 -- the 209th anniversary of American independence. Damage in the attack, carried out in the early morning hours of the 4th, was estimated at $400,000. Two days later, JDL leader Irv Rubin showed up at the site of the gutted IHR offices to publicly praise the arson attack. The JDL, he declared, "wholeheartedly applauds the recent devastation of the offices of the Institute for Historical Review." Denying any personal responsibility himself, Rubin said that the criminal attack had been carried out by a former JDL activist named Larry Winston (Joel Cohen). "I believe, with all my heart, that he [Winston/Cohen] had something to do with this" arson, Rubin declared. Apart from local news coverage, American newspapers and television reported almost nothing about this act of criminal "book burning." This skewed media treatment moved noted journalist Alexander Cockburn to observe (in the pages of the liberal weekly The Nation): "The outfit in the United States that does publish material belittling generally accepted accounts of the Nazi extermination of the Jews is called the Institute for Historical Review. I don't recall much fuss when its offices in Torrance, California, were firebombed in July 1984. Perhaps this is what Mailer meant by "sophistication" in handling such heterodox opinion." At the same time, though, a few prominent voices courageously spoke out against the attack. American historian John Toland -- who received the Pulitzer prize for general non-fiction in 1971 for his book The Rising Sun -- wrote to the IHR: "When I learned of the torching of the office-warehouse of the Institute for Historical Review, I was shocked. And when I heard no condemnation of this act of terrorism on television and read no protests in the editorial pages of our leading newspapers or from the halls of Academe, I was dismayed and incensed...I call on all true believers in democracy to join me in public denunciation of the recent burning of books in Torrance, California."